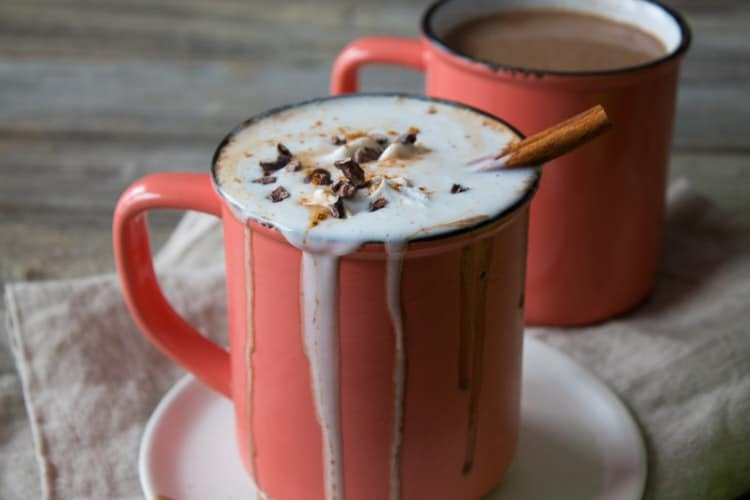 This vegan boozy Mexican spiced hot chocolate is perfect for a Valentine’s Day date night or to get cozy with on any cold, blustery winter’s night. Sweet, spicy and boozy. What more do you need? One blizzard and you’re like awe, this is pretty. Two blizzards and you’re like, alright, starting to get old. Three blizzards and you’re all all like I gotta make some boozy hot chocolate to get through this. And make arrangements to move to California. At least that’s how I feel anyway. This is the craziest winter I’ve seen in Boston to date. 6 feet of snow in 17 days! Whaaaa? Might as well be back in Buffalo. The only difference being that Buffalo has a gazillion years of experience dealing with snow like that whereas Boston has like none. Cue public trans malfunctions. Insane traffic. And crabby people. For these reasons alone I feel extremely grateful to be working from home this winter. Stress-free. 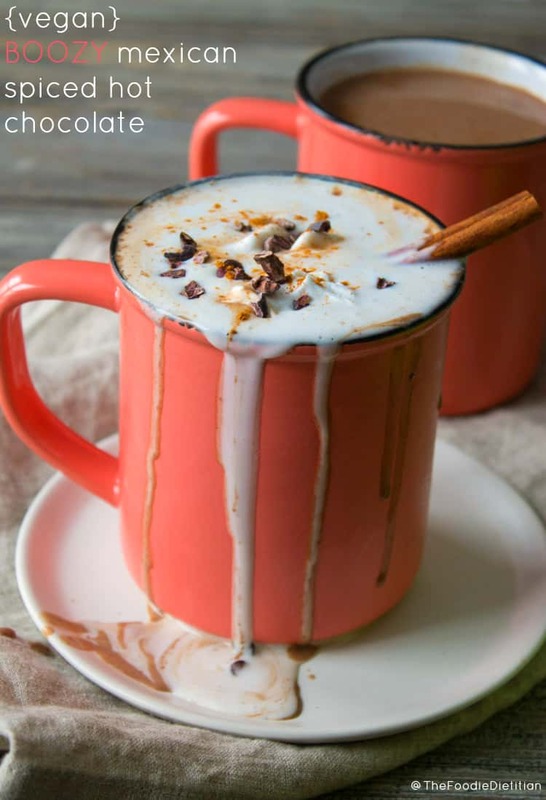 And when you’re stuck inside your home for the third week in a row, it’s totally acceptable to make the most delicious hot boozy beverage of your choice. For me that was boozy hot chocolate. Hot cocoa brings back so many good childhood memories – it was the drink waiting for us after hours of playing outside in the snow. Such a delightful, comforting way to end a fun day. And as an adult, who’s to say we can’t up the ante? Plus, with Valentine’s Day around the corner, I think this is the perfect drink to end the night with. Or, to start your day with. Depending on how you roll ;). On a stovetop over low-medium heat, add coconut milk, cocoa powder, sugar, cinnamon, chipotle powder, and cayenne and whisk together until smooth and temperature is hot. Once hot enough, add mezcal and stir. Pour into two mugs. Optional: garnish with coconut whipped cream, cocoa nibs and cinnamon. I originally tried this recipe using full fat canned coconut milk but found it to be too thick and rich for my tasting. The coconut milk beverage was a welcome solution. 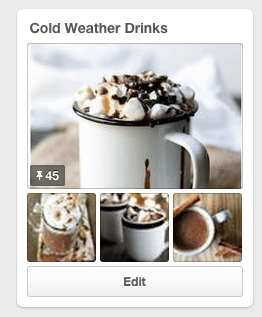 And if you’re thirsty for more delicious cold-weather beverages, check out my new Cold Weather Drinks board on Pinterest. 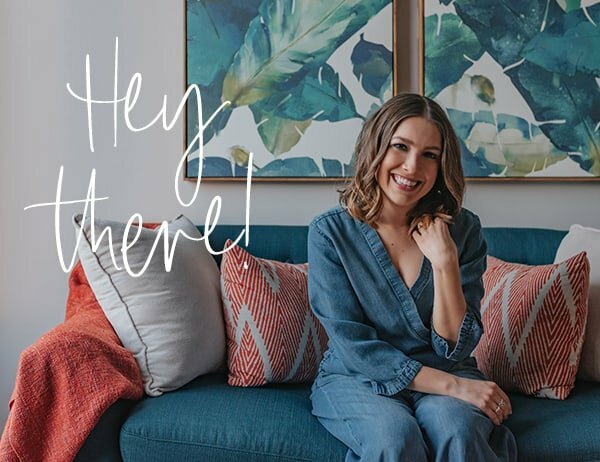 Speaking of Pinterest, my page has a brand new look & feel! More boards. Better pins. 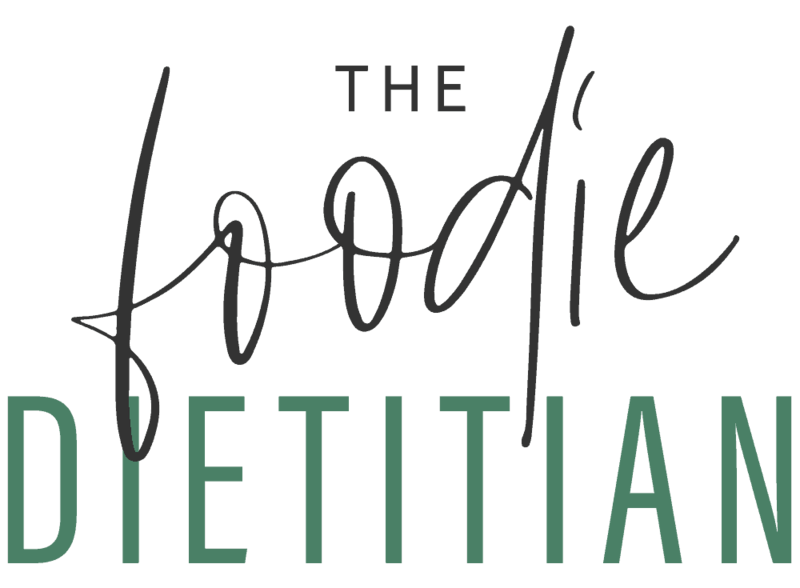 Follow me for delicious foodie, yoga & mindfulness visual inspiration! 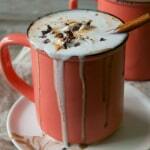 Tell me, what’s your favorite way to make hot cocoa? 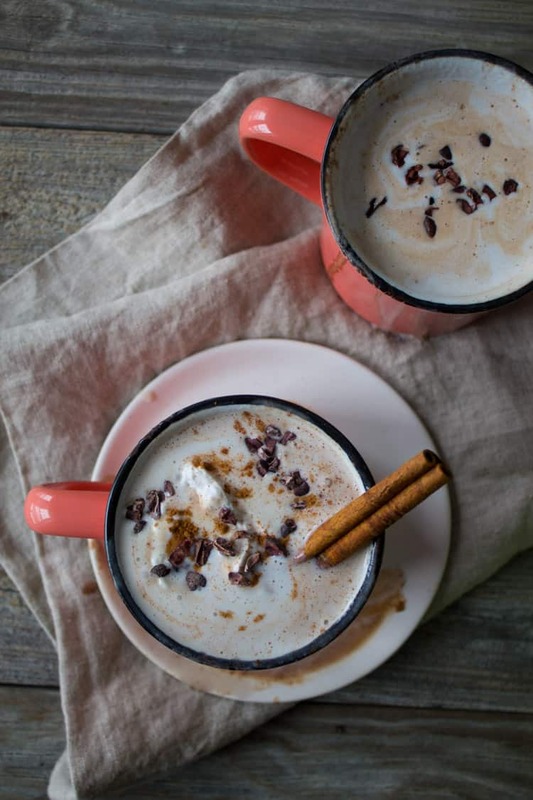 Classic hot cocoa all the way? Or, do you like to get creative? What other alcohol can I substitute for mezcal? We don’t get it where I am from. LOVE this! So glad I got out of there when I did :). Working from home is good. And California. Thanks, Anne! You were smart! The fiancee and I keep talking about moving to California after this crazy winter. I need this right now! It is so cold here! 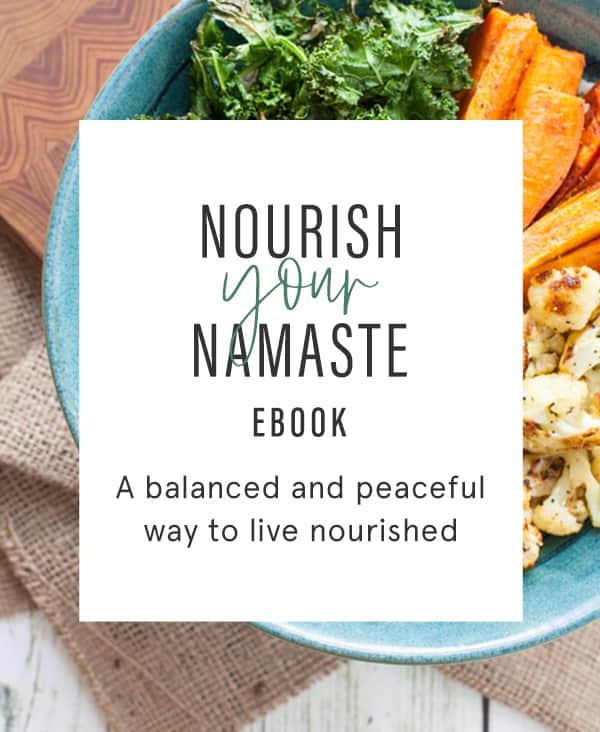 Love the photos and your story!